60 min Whole Park Session. Trampolining has been shown to help with a wide range of sensory, developmental and physical disabilities. In our Disability Sessions, the whole park and its facilities are made exclusively available to members of recognised disabled groups and societies and caters for a wide range of disabilities. 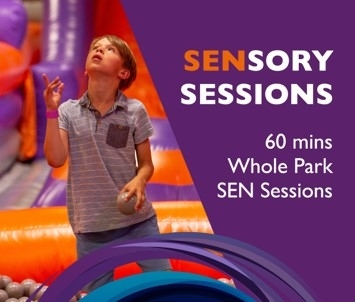 Our tailored sessions with specially trained marshals offer a fun environment focussed on sensory engagement, offering therapeutic exercise to participants with reduced sound and lighting.